Eating a balanced diet and exercising regularly are the keys to a healthy life. But sometimes, the stress of day to day forces us to take time away from physical activity and we stop going to the gym or do not go running as we had planned. But to help you stay in shape here you have the best Android fitness and workout apps to exercise. 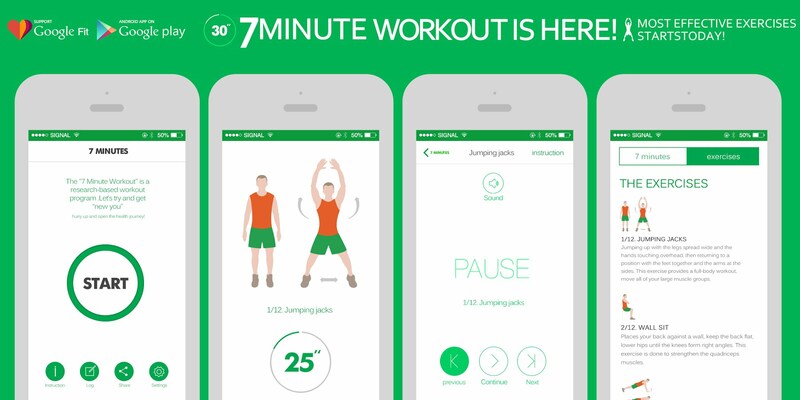 This can is the best fitness app for people with little time. It is based on a circuit of 7 minutes of high-intensity training. During these 7 minutes, 13 exercises have to be done, each of these exercises must last 30 seconds and there must be 10 seconds of rest between them. This application is ideal if we have little time to exercise since the method promises to get us in shape in seven minutes. One of the best applications of 2016. With this application every five weeks we will have the challenge to fulfil. Each day we will have a goal to fulfil to make it more bearable. It has goals every 30 days to strengthen body parts in particular or the entire body. Each day reminds you that you have a goal to fulfil and has video guides for the exercises. Each day the challenge is a bit bigger so that little by little you achieve your goal. This application is a personal trainer to discover all the muscles that you have in the body. No matter your level since you have assistance from beginner to professional. Thousands of routines with variations to define and shape your body. We have exercises with machines and weights, all of them very well explained with high-quality photos and videos. This application reads like this “without devices, without excuses” that is, we only need a little bit of willpower … Sworkit divides its exercises into four big blocks: strength, aerobics, stretching and yoga. Within each of these categories, we can choose which part of the body we want to exercise. Once we have selected the exercise that we want to perform, we choose the minutes that we want to use to perform that exercise and we can start. Each exercise comes with an explanatory video. The name gives us a clue of what we can achieve with this application. This application promises to burn abdominal fat and I have to say that if we follow their exercises to the letter we will achieve it. Already level 1, the basic for beginners, leaves you exhausted. Each exercise routine is well specified, the time that each exercise must last and the rest times between each of them. It also has explanatory videos to not lose detail. Flat belly has, in addition, a food plan, yes, if we want to prepare a diet we have to pay for its advanced program. This application has a long series of exercises with which you will be able to work certain parts of your body. The exercises are simple and at the most, you will need some weights. All of them are explained in detail and you can choose how many days per week you want to train to dose the effort. It also has different levels of hardness depending if you want to be in shape or define something more. This is the ideal application to train without leaving home. We can make several types of circuits. The HICT training is the high intensity and includes jumps, squats, push-ups, sit-ups and sit-ups. The application tells us the number of times we have to repeat each exercise and the time it takes to perform it.